It is an article of faith to some class warriors that the rich do not pay their “fair share” of taxes. Is it true? We can evaluate this claim since there is plenty of publicly available data. The data here comes from a 2016 CBO report. It is difficult to look at the tax brackets themselves and draw a definite conclusion about fairness. Taxable income for most people is impacted by various deductions, exemptions, and credits that phase in and out at different income levels, and that apply in some circumstances but not others. “Effective tax rates” cut through all this complexity and tell us what percentage of income is paid out as taxes. For example, someone who pays $5,000 of taxes on $50,000 income has an effective tax rate of 10%. The graph below shows effective income tax rates for different income groups. The lowest quintile represents the one fifth of the population with the lowest incomes, the highest quintile represents the one fifth with the highest incomes, and so on. I also include the top one percent to show the very highest earners. 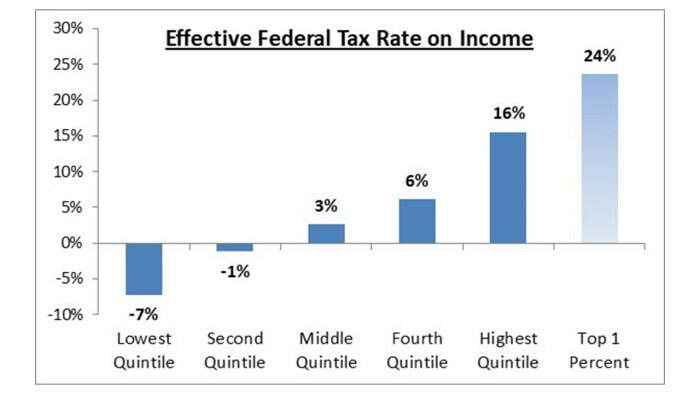 As you can see, the effective tax rate for the lowest one fifth of earners is quite low at negative 7%. The rate is negative because low earners pay no federal income tax and in fact receive cash payments from government due to credits like EITC. The second-lowest quintile is also negative, which means the bottom 40% of income earners pay no income taxes and receive a cash subsidy from the tax code. For the middle fifth of earners, only 3% of their income goes to income taxes. The top fifth pays 16%. At the very high end, the One Percenters pay 24%. Clearly, those with high-incomes pay much higher taxes than those with low incomes. Some people admit that the rich pay their “fair share” of income taxes, as shown above. However, they claim that the rich don’t pay their “fair share” of total taxes, including payroll taxes (Social Security, Medicare). We can also evaluate this claim. The same CBO report includes a comprehensive view that includes ALL federal taxes. It includes the income taxes mentioned above plus all payroll, corporate, and excise taxes. 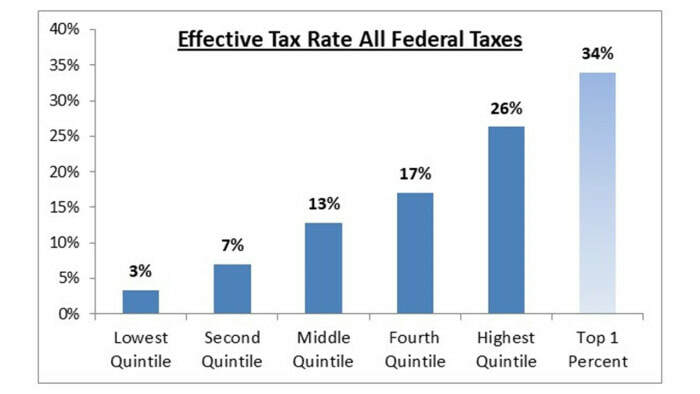 As you can see, when we include ALL federal taxes, the lowest one fifth of earners pay an effective tax rate of 3%. Not negative, but still quite low. For the middle fifth, it’s 13%. For the top fifth, it’s 26%. The One Percenters pay 34%. Still lopsided. To put this in dollar terms, it roughly means that someone making $1,000,000 will pay $340,000 in federal taxes, while someone making $10,000 will pay only $300. Another way to look at this is to compare the share of total taxes paid to the share of total income earned. The chart below shows this data. Taxes here include ALL federal taxes. As you can see, the bottom one fifth of earners earn 5% of total American income, but pay less than 1% (0.8%) of total federal taxes. The middle fifth earn 14% of total income and pay 9% of total taxes. The highest fifth earn 53% of income and pay 69% of taxes. The One Percenters earn 15% of income and pay 25% of taxes. 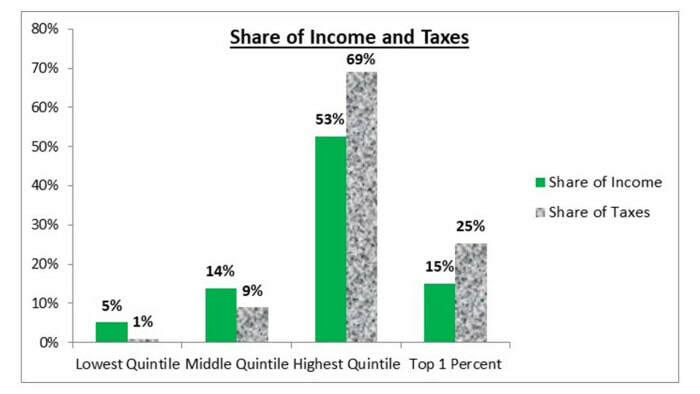 Note that only one quintile pays a share of taxes that exceeds their share of income, and it’s the highest quintile. Note also that the One Percenters pay the highest share of taxes relative to share of income. This data shows that high earners earn a large share of total income. However, it also shows that they pay an even larger share of total taxes. So, do high-income folks pay their fair share of taxes? “Fair share” is a vague and nebulous concept, but I’ll try to answer the question. Let’s evaluate (a) in absolute terms and (b) in comparison to other income groups. In absolute terms: The question here is, do the One Percenters pay ‘enough’ taxes? 34% of their income goes toward federal taxes. But that’s not all; they also pay other taxes. State and city income taxes, property taxes, various sales type taxes, etc. Including all types of taxes, most One Percenters pay 45% to 55% of their income in taxes. Is that high enough? It’s a judgment call, but in my opinion, it’s high enough. If half or more of your income is taxed away, you are working more for government than for yourself and your family! In comparison: The question here is, do the One Percenters pay enough taxes compared to other income groups? The data is crystal clear. High-income folks pay much higher taxes than either the poor or the middle-class. For each dollar of income, the average One Percenter pays eleven times more taxes than the average person in the bottom quintile. I think eleven times more is enough more. Conclusion: It seems reasonable to conclude that the rich do indeed pay their “fair share” of taxes. Claims to the contrary are closer to fact-free propaganda. Despite the facts, no doubt some readers are still not persuaded that the rich pay enough taxes. They should understand that the tax code cannot eliminate economic inequality. First, inequality is created outside the tax system. The tax code does not create inequality. Second, there are limits to what can be done via taxes. A limited amount of redistribution is good for society, but too much will cause economic stagnation. Why? Because high taxes and generous assistance programs discourage both high and low earners from engaging in productive economic activity. Third, economic stagnation is not good for anyone, including low earners. The importance of economic growth cannot be overstated (see this post), and growth is better for everyone. Too much redistribution kills the goose that lays the golden eggs. A focus on growth is more socially harmonious and economically effective. The well-to-do already pay disproportionately higher taxes to help the less-fortunate. Can we call a ceasefire in the class war, and focus on growth?